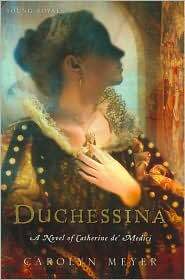 Caterina de' Medici, or Duchessina as her family and friends call her, lives with her "uncle," Cardinal Giulio. Her life is a lonely one for very few people come to visit her in the Medici Palace. The one person who does come to visit her is her aunt Clarissa, Caterina's dead father's sister. Both of Caterina's parents died when she was just an infant and now she is under the care of the Cardinal. It is not easy being a Medici because many of the people in Florence hate the family and want to get rid of them. It is bad enough when Caterina's uncle lives in the palace but when he becomes the new pope, Clement VII, things get a lot worse. Charles the V, the Holy Roman Emperor, decides that Clement VII needs to be put in his place and Charles sends his soldiers to Rome to teach the Holy Father and his people a lesson. When Clement flees Rome leaving it to the mercy of Charles' soldiers, the people of Florence are furious and decide to take their anger out on Clement's relatives, the de'Medici. Caterina's aunt Clarissa does her best to get eight year old Caterina to safety outside the city but they are caught and Caterina is brought back to Florence and forced to go into a convent. The nuns in the Santa Lucia convent hate the de' Medici with a passion and though they are not obviously cruel to Caterina, they still manage to make her life a misery. Then help arrives from an unexpected quarter and Caterina is moved to another convent, Le Murate, where she is treated with kindess, where she makes friends, and where is educated. Caterina hopes that she will be left alone to stay in Le Murate where she is happy. Even during a siege of the city things are better at Le Murate than they were in Santa Lucia. When the siege finally ends Caterina is summoned to Rome. She is to live under the "loving guidance" of the pope, her uncle. In fact, once she gets there Caterina comes to realize that she is in Rome so that the pope can show her off and thus get find an advantageous marriage for her. It is with dismay that she learns that she is to be married to the second son of the current king of France. And so when she is just fourteen years old Caterina de'Medici is sent to France to marry a boy she has never met, one who, she soon learns, has no interest in her whatsoever. Caterina de'Medici has a very bad reputation in history books so it is interesting to discover that this woman who came to called "Madame Serpent" was once a defenseless girl who had a very hard childhood and adolescence. It is easy to see why she became the hard and ruthless woman who was the power behind the French throne. Life had taught her that that was what you had to do to survive. Beautifully written and utterly engrossing from the first page to the last, this addition to the Young Royals series, is an outstanding historical fiction title.